Assist NY is an ISO 9001:2015 accredited company, maintaining international standards in the translation field. We offer translation services at an affordable rate of $17.5 per page (for 250 words). We have a Free Quote option to help you estimate your project. We redefine quality translation services by providing our esteemed clients superior translation services, even when handling ORDERS enabling them to relay business and important messages across Rochester NY, and other parts of the world. Our professional team of linguists, native speakers, and seasoned translators provide world-class, prompt, and service-oriented translations which have best accuracy. We have 1000+ human translators who are certified and can deliver express and rush services with constant quality checks. We have a passion for language translation services because of which we provide customized solutions to 100+ languages all over the world. We assure your files privacy and security.The clients needn’t fear about spam! The files uploaded in our website are spam free. We maintain your data with utmost confidentiality. So you can safely send your files for quote estimation. Once the project gets completed, we provide our clients with Company and notarization certifications on demand. 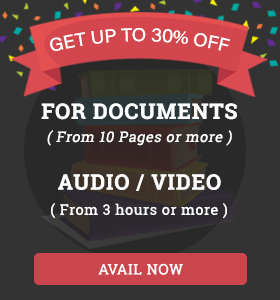 We accept the following document formats such as Word, PDF, PPT, and also other word processing formats. We also accept customized and standard audio/video file formats such as MP3, WAV, MP4, AIFF, AVI, AU, WMV, MOV, MPEG, WMA, SWF, MIDI, and others. The hard copy of the final output can be sent by mail on request. To enquire about our services, contact us at our TOLL FREE NO 1-888-535-5668 or Click INSTANT CALL BACK.